A beautiful 4mm slightly rounded profile ring which comprises of a wide band of Titanium inlaid with a thinner band of 18 carat yellow Gold. The two contrasting metals are separated by a subtle grooved channel, and are both finished with a satin texture. The inside of the ring is finished with a high polish. The grooved channel is set with a single 1.7mm (0.02ct) brilliant cut white Diamond. 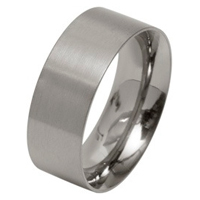 The ring is marked inside with the manufacturers mark "UNQ" (Unique) "18K" and "TITANIUM" so that you can be sure that you are receiving a genuine branded item. Please note, this style of ring is specially made to order, and you would need to allow us about 3 weeks from placing your order. As they are "specials" we would send you a ring sizer upon receipt of your order, and would need an email confirming your size before we proceed, which would then save further delays of an exchange being required.